Right after Matthew arrived home from Kentucky Music Week, this beautiful field down the road from our house was busting out with sunflowers. What better place to take a music video!?! So for the next four days, he went out there and shot footage and recorded his latest music video, Ashoken Farewell. Before heading out on our next road trip/festival, I ordered a leather hide to experiment on making dulcimer dusters. I've been working on this project for almost 3 years now, trying different materials for the fabric and inner spine, as well as different sizes. We finally have a finished product that we are ready to put on the market. Matthew took this picture for our website store! After being home for a little over 2 weeks, we hit the road (all together this time), and made our way to Evart, Michigan for the annual ODPC Funfest. 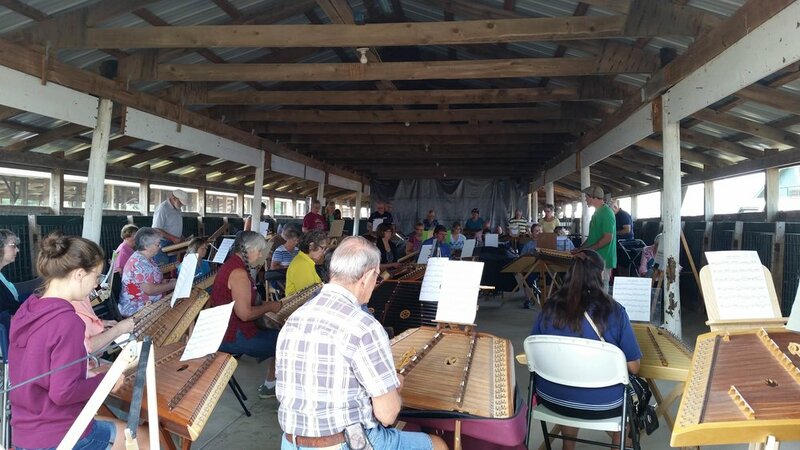 This is the largest Hammer Dulcimer event in the world! Matthew taught 6 workshops during the days and then had a performance slot on Saturday night to a packed out crowd. We were camping once again, this time with two little boys, so most of my time was spent keeping them busy or staying at the tent for nap time. But I always enjoy meeting the folks there and listening in on Matthew's classes and performance. The boys love music, so that is in my favor since everywhere you turn someone is playing something! It helps keep them entertained. Matthew set up as a vendor for the first time this year. He did well selling his second album as well as other products. A big thanks to all who support the vendors by buying products at these events! After spending 4 1/2 days in Evart, we packed up and headed down to Dayton, OH where Matthew's family is. We spent the next week there, introducing everyone to Levi and spending time with loved ones. 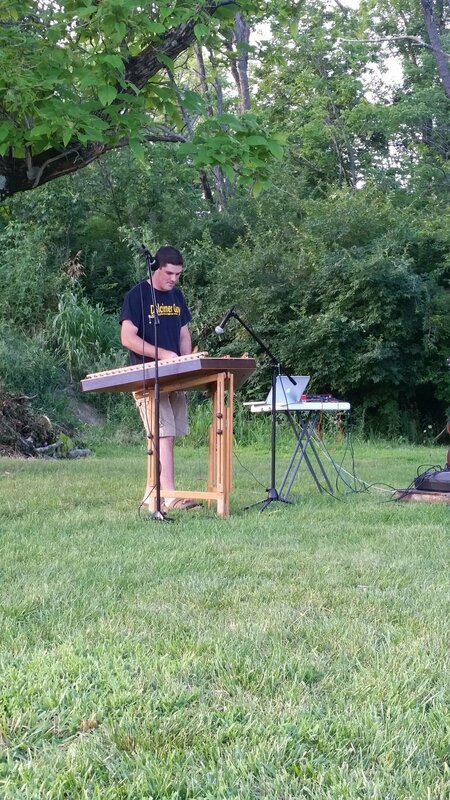 On Saturday, Matthew held a free concert on his brother's lawn for family and friends. Some folks even showed up from the local dulcimer clubs. It was a beautiful day and the concert turned out really well. Lots of people who he hasn't seen in years showed up and wished him well in his musical endeavors. It was nice catching up with them all (for me, it was nice to finally put a face with a name!). Several friends brought snacks and lemonade to share, which was really sweet of them. We've been home for the month of August, which has been nice, but we are hitting the road again in September and October, so I'm sure we'll be meeting up with some of you. Happy trails to you!